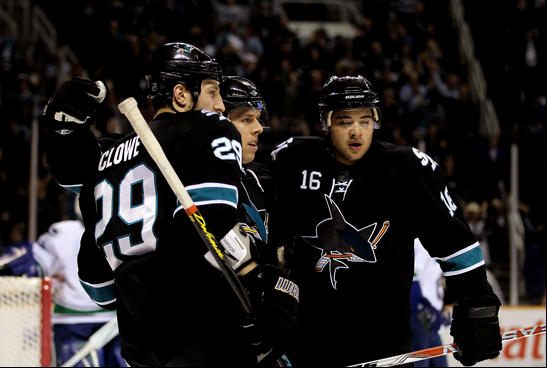 Quite the Olympic hangover for the Sharks as they lost to the New Jersey Devils 4-3. 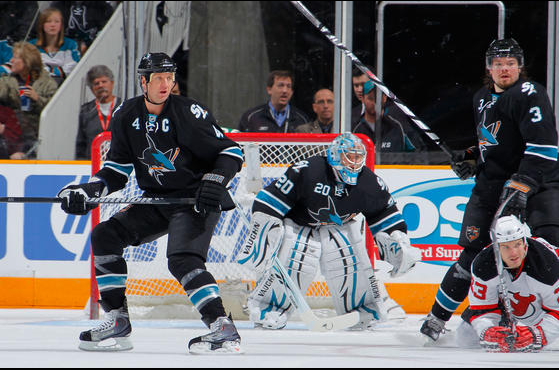 San Jose showed the national audience about three minutes of competence, which was surrounded by 57 minutes of Latvian play. I don’t even know who I was watching for the first 48 minutes of the game — really. Obviously going from the Olympics to the NHL regular season is a ginormous step down in pressure, but wow. I had hope that the Olympics would be like ankle weights; take them off and absolutely fly. Nope. Thank you, come again. Sharks coach Todd McLellan was like “W-T-F, man? !” Poor sell-out crowd. They waited two weeks after that Buffalo loss just to see another clunker. The second period is when things really fell apart. Evgeni Nabokov was seeing Canada jerseys again (come on now, the Devils jersey do resemble them) and let in three soft goals. Bad, bad, bad. 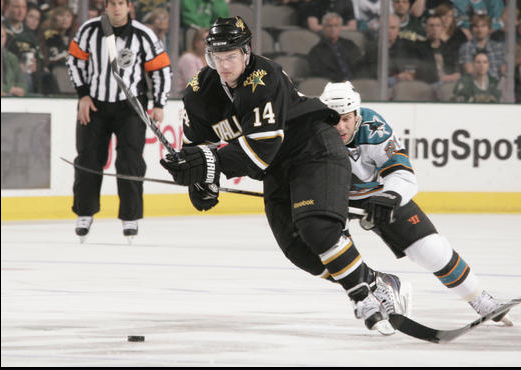 One goal dropped behind him, and while Nabby did his trademark “peek behind,” he couldn’t spot the puck. Devils goal number two was a slapshot from the point that went in cleanly. No excuse for that. 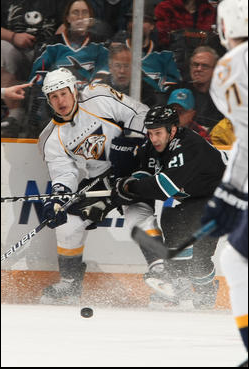 I don’t remember anyone being in front of Nabby directly. Devils goal number three was a wrister from the point by fellow Russian Ilya Kovalchuk. Again, stoppable. Again, unaccetpable. Third period rolls around and Patrick Marleau tried being Captain Canada when he ignored Doulgas Murray’s pleas to defend Travis Zajac. Patty tried to steal the puck away from another Devil — fail. Wrister in the net from Zajac. Oh, but wait. 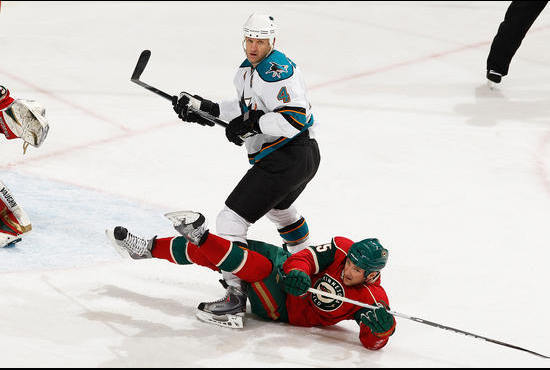 The Sharks transformed into a Zach Parise-Ryan Kesler hybrid at the 12-minute mark of the third period. You know — late-game heroics, energetic skating — the whole enchilada. Devin Setoguchi struck twice in two minutes on Canada-reject Martin Brodeur (yes, I said it). Joe Pavelski buried a third goal a minute later, and the Shark Tank was a-rockin’. 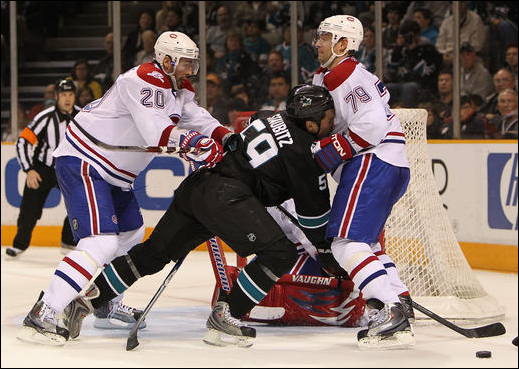 Side note: Before that third goal, I actually saw Thornton skate the hardest I’ve seen in a long time for a loose puck. Those five seconds of brilliance were awesome. But the Devils coach ruined all the fun with a timeout, and the Sharks couldn’t manage a fourth goal. They were just too stupid earlier in the game. Shame. An unfortunate start to the homestretch, but at least the loss is to an Eastern Conference opponent. And Manny Malhotra was back tonight after missing some games before the break. 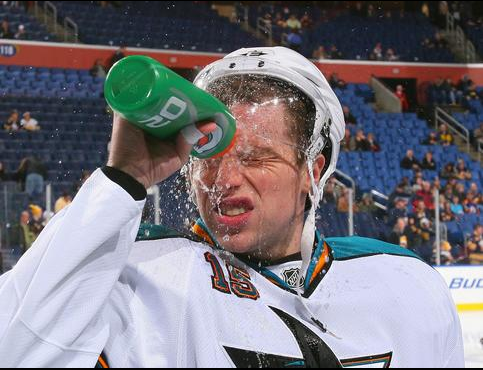 Marc-Edouard Vlasic is still out, though. Lower-body injury is what they say. The Devils only took one penalty the whole game. Granted the Sharks did score on the power play, but you have to draw more penalties on a trap team like New Jersey. They’ll lull you to sleep, a la Phoenix. Hit-O-Meter: SJ 29 NJD 14; Niclas Wallin and Murray both had four. Olympics thoughts: I don’t think there could have been a worse scenario than watching Crosby score that overtime goal. Now the Crosby worship will reach levels I could have never imagined. I cannot stand that guy. U-S-A, U-S-A! The Canadiens come to town Thursday.